APEPDCL (Eastern Power Distribution Company of Andhra Pradesh Limited) Has Released Recruitment Notification For 02 Environmental Specialist, Social Expert Posts. 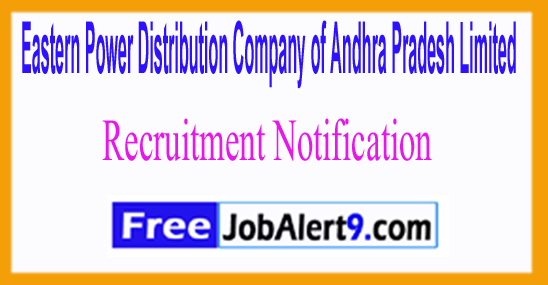 All Eligible & Interested Candidates Can Apply Offline,Further Detailed Information Regarding Educational Qualifications, Age Limit, Selection Procedure, Exam Pattern, Syllabus for APEPDCL (Eastern Power Distribution Company of Andhra Pradesh Limited) Recruitment 2017 - 02 Environmental Specialist, Social Expert Post is mentioned below. Candidates upper age limit should not Exceed 45 -Years. Candidates should have done Post Graduation Degree (Social Science) / its equivalent qualification from A recognized university. All Eligible & Interested candidates must send by hard copies of application a long with relevant testimonials (Mentioned In Detailed Advertisement) to the following Address before or on 15th June 2017. To CGM/HRD Eastern Power Distribution Company of Andhra Pradesh Limited Corporate Office, P & T Colony, Seethammadhara, Vishkhapatnam - 530 013 . Last Date for the Submission of Application -15-06-2017. Click Here For APEPDCL Recruitment 2017,Advertisement.